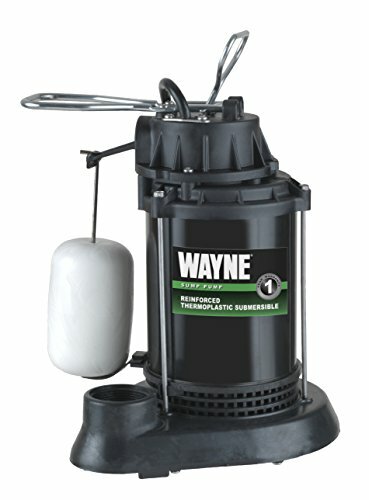 1/3 hp, thermoplastic, submersible sump pump, with vertical switch, designed for 11 inch diameter or larger sump basin, pumps up to 3600 gph at 0′, reinforced thermoplastic submersible sump pump, vertical float switch for automatic operation, oil filled, thermally protected motor prevents overheating, reliable, reinforced poly carbonate impeller, top suction design filters debris & minimizes clogging, designed for easy installation without any Plumbing changes, float guard protects switch from hang ups, epoxy coated steel, high performance 1/3 hp, motor, 1-1/2 inch NPT discharge & reinforced thermoplastic base. This product is assembled in the USA. Easy installation and easy handling.Assembled in the US with foreign and domestic parts.